If you were to judge this book by its cover you would be forgiven for thinking it was the latest offering from the ‘alternative’ Egyptologists, Von Daniken perhaps? But no. Toby Wilkinson is playing them at their own game, and wins hands down. Genesis of the Pharaohs is a brilliant account and interpretation of the latest work on the Eastern Desert rock art. It was in 1999 that Toby Wilkinson set out on the first of his ambitious recording expeditions, gradually photographing, drawing and mapping the locations of each piece of art his team came across. He was following the footsteps of a Russian scholar Golenischeff, who was the first to venture out into this inhospitable area of Egypt in 1887. In 1907 English Egyptologist Arthur Weigall and then in 1936-7 German scholar Hans Winkler also carried out some recording but since then there had only been a few small expeditions to the area. Full credit is given to David Rohl for reawakening interest in both the area and the art, although a critique of his interpretation of it is given, particularly on pp 30 and 148, with reference to the ‘Followers of Horus’. But how could this be? Traditional beliefs in the origins of ancient Egyptian culture say that the peoples occupying the wetter, more fertile, ancient savannahs of Egypt’s margins gradually moved into the Nile Valley as the climate dried up. It was once they had reached the valley that the culture slowly developed. What this rock art suggests is that in fact the two cultures were one and the same. The herdsmen followed the best pasture. In season they travelled up into the wadis (dried up river beds) to the fertile lands, where they carved images of their lives into the rocks under which they sheltered. They then travelled back into the Nile Valley, where they painted the same images onto pottery. These people drew on the life around them in both the desert and the valley, for their inspiration. There are picture of warriors smiting their enemies, herdsmen with their cattle, ostriches, ibex, hippos, deities wearing feathered head-dresses, family groups, and hundreds of boats. Some of the sites have extraordinary quantities of images, some are hidden away behind rocks, some are under overhanging shelters, some are only visible at dawn, some only at sunset, but they are all a ‘written’ account of the lives of the most ancient Egyptians. 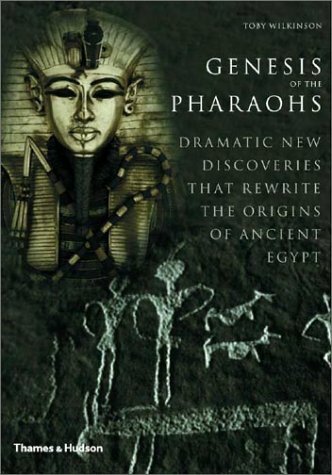 In Genesis Dr. Wilkinson has managed to write an exciting and fascinating story of his journey into the Eastern Deserts and the ancient past of Egyptian civilisation. Unlike other writers who make similar claims about their ‘spectacular discoveries’ his work is based on solid archaeological fact, an indepth knowledge of Egyptian prehistoric culture and just a little inspired thinking! Here we have before us two recent reissues of a classic Egyptological title. It is a pleasure to be able to announce that this book has been brought back into print after so long. It records the Theban excavations undertaken by the Earl of Carnarvon and Howard Carter, more than a decade before their sensational discovery of the Dynasty XVIII tomb of Tutankhamun (KV 62). The results of these researches included, among other things, uncovering the interesting early Dynasty XVIII decorated tombchapel of the mayor Tetiky (TT 15), bringing to light the famous historical inscription on a writing board, known as the ‘Carnarvon Tablet I’, and fruitful archaeological explorations carried out in the Deir el-Bahari vicinity. The volume also contains brief reports by several eminent specialists on the finds. The text is accompanied by, given the initial date of its publication, a generous number of informative and attractive plates, consisting of both photographs and drawings. Owing to its extreme rarity and high antiquarian value, few individuals nowadays have been able to own a copy of Five Years’ Exploration until now. However, these two new editions of it have vastly different asking prices. One is reasonably set, it seems to me, considering it is a limited, hardcover reprinting of a scholarly title. The other appears to be more aimed at fortunate lottery winners or select libraries willing to pay an exorbitant amount to fill a gap in their collections. It is a great pity that the house of Kegan Paul steadfastly continues to publish desirable Egyptological volumes, both reprints and important original works, at costs which are far and away beyond the means of most, save for the privileged few. As it has been aptly pointed out elsewhere, astronomical book prices only encourage budget-minded students to photocopy in toto, rather than purchasing. The sensibly priced new series of valuable reissues by the London firm of Gerald Duckworth & Co., clearly sets the way on this matter (see AE 3 no. 4  pp. 26-27). They are making long out-of-print books accessible to everyone interested in the subject area. This is a trend which is most welcomed by all ancient Egypt book-lovers. The enterprising American team of Martino Publisher & John Pye Rare Books are also to be heartily congratulated for their other affordable and high quality reprints as well. This is particularly true for bringing the fundamental volumes of George Andrew Reisner’s (1867- 1942) investigations on the Giza plateau back into print once more. This is no get rich scheme, but a service to Egyptology. The Earl of Carnarvon and Howard Carter, Five Years’ Exploration at Thebes: A Record of Work Done 1907-1911. (Oxford University Press: London and New York, 1912). Reprinted by Maurizio Martino Publisher & John William Pye Rare Books (USA). 100pp with seventy-nine plates and frontispiece. Hardcover. £67/$95.00. 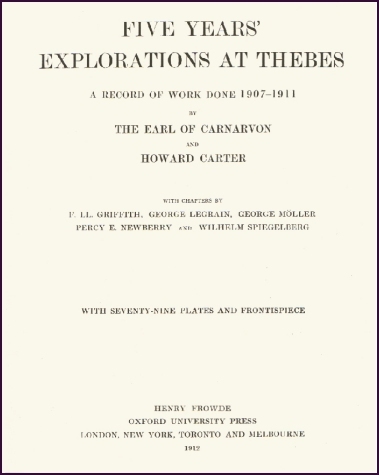 The Earl of Carnarvon and Howard Carter, Five Years’ Exploration at Thebes: A Record of Work Done 1907-1911. (Oxford University Press: London and New York, 1912). Reprinted by Kegan Paul: Library of Ancient Egypt (UK). 100pp with seventy-nine plates and frontispiece. Hardcover. (ISBN 0710308353). £150/$255.00. This splendid volume is an updated and considerably expanded version of the author’s long out-of-print Forgotten Pharaohs, Lost Pyramids: Abusir (Prague, 1994). That work, even at the time of its release, became something of a collector’s item, owing to its very limited distribution. As Professor Verner informs us in the Preface to the reissue: a series of important new discoveries made by the Czech archaeological team in Abusir in recent years-especially, in Neferefre’s pyramid, Iufaa’s shaft tomb and the South Abusir cemetery- have made a new edition of the book urgent.’ The text now bears a different title, and appears under the imprint of the American University of Cairo Press, the Middle East’s leading English-language publisher, which assures its popular availability to all those interested in ancient Egypt. Miroslav Verner has headed the Czech excavations in Abusir for more than twenty years. His research there will already be at least partially familiar to many readers of AE from his superb and seminal The Pyramids: The Mystery, Culture, and Science of Egypt’s Great Monuments (2001). The present book has also been written in an engaging and lively style. 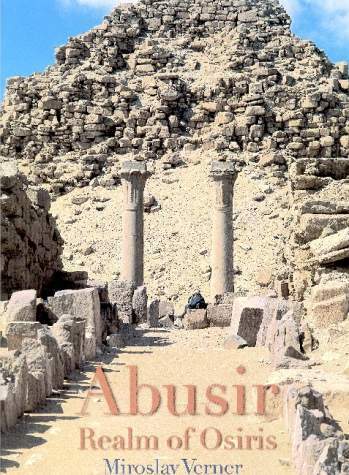 As the leading authority on Abusir, which is situated between better known Giza and Saqqara, the author takes us on an historical journey to the pyramids, tombs, and temples of this somewhat unfamiliar site, far off the path of most tourists. The monuments to be seen there range in date from the Old Kingdom to the Late Dynastic Period. Special emphasis is placed on the recent discoveries of the dedicated Czech archaeological expedition. These include up-todate coverage of fieldwork on the grand mastaba of Ptahshepses, the finding of the never used burial chamber of Udjahorresnet, as well as the exciting unplundered shaft tomb (80 feet underground) of Iufaa, which was widely reported in the world press. There is also an absorbing account of the famous Old Kingdom papyrus archives found at the site. This handsome book is not to be mistaken for, yet, another glossy coffee-table tome. To the contrary, it is a scholarly endeavour, graced by a rich assortment of lovely illustrations. I only wish there were more books like it.